Statistics: on which devices (Mobile, PC, Email Software and Webmail) your recipients open your email campaigns? You can now check the device, the Web browser, and even the Webmail used by your recipients to open your Newlsletters. This advanced email marketing statistics option is available for all MailKitchen users and you can access it by clicking on the ‘Statistics’ tab in the Menu. You will thus get to the statistics page of the selected campaign. For displaying the reports on Mobiles and Desktop usage (Web browsers or Webmails statistics), click on the “Statistics of email clients” button. Here you can see what does the chart of Mobile vs Desktop usage and open rate look like. 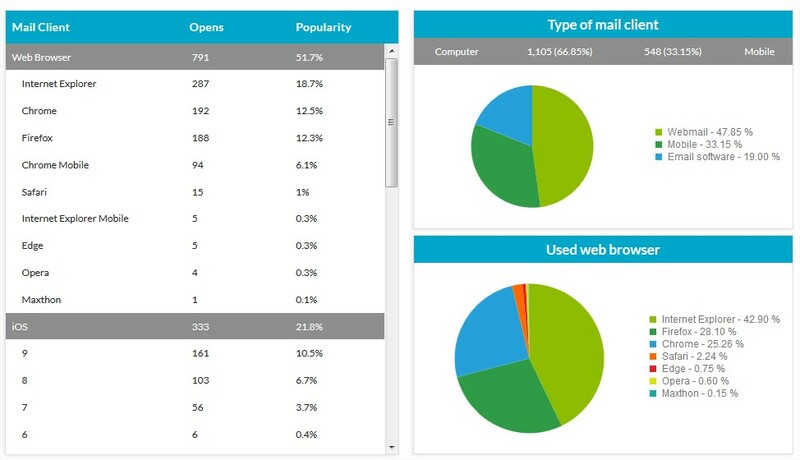 On the right side of the screen a pie chart shows the breakdown of Moible, Webmail and Email Software usage and open rates. Webmail and Email software refer to Desktop usage and open rates (PCs, laptops), whereas the tab Mobile gathers statistics regarding open rate on smartphones or tablets. Webmail – Email opened on a Webmail (Gmail, Hotmail, Yahoo, or other) using a PC (personal computers, laptops). On the left side of the screen you can see the detailed statistics with the list of Mobile operating systems, Web Browsers or Email software. They allow you to know on which, Web Browser or Software you should test your campaign before sending email. They allow you to track differences in the Mobile/Desktop usage based on different criteria (for example, the time for sending your eemail campaign), and thus adapt your email campaigns to the targeted devices. In a broader view, these statistical reports allow you to adapt your overall communication strategy (website, advertising campaigns, email campaigns) to the habits of your customers and recipients.